Email software (Outlook, Apple Mail, Thunderbird) will display a warning message when attempting to make an SSL connection to our email service using pop.your-domain.tld or smtp.your-domain.tld as the incoming/outgoing mail server host names. 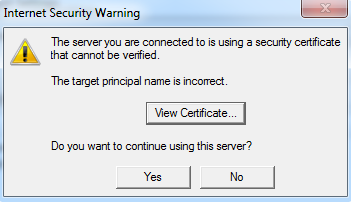 The warning message will say that the server that is being connected to is using a certificate that cannot be verified. The reason for this warning is that the SSL certificate installed on our shared mail servers belongs to .redyhost.net.au and not the host name that is being connected to (mail.your-domain.tld). The email client is simply warning you that the server they are connecting to may not be the server they think it is as the email client assumes that the user thinks the server they are connecting to is called your-domain.com. All our mail servers have a dedicated SSL certificate installed on them. If a user wants to avoid the above warning message, they must connect to the servers while using the name mentioned on the SSL Certificate installed on the server.